... and other words of wisdom, quotes, etc., from Doctor Who. This was a nice surprise: the latest instalment of Alan Moore and Kevin O'Neill's Century series of the League of Extraordinary Gentlemen was released today, so I downloaded it straight away through the Comics app. It's just $4.99 digitally. I've haven't read it through yet, but I was schoolboy-giddy enough to flick rapidly through the pages quickly, looking at how this one is put together ... and to see what winks, nod, in-jokes, allusions and asides are packed inside. There are quite a few, right at the surface, from Bond girls to 30 Rock to Doctor Who to the Lion King, of all things. I imagine it would really help, again, to be English to spot some of the background characters who pop up in these books! I'm setting it aside for the weekend. It looks like a treat, with the same attention to detail and sidebar production values (the fake ads are as complicated as anything else) as the preceding ones. A Community spinoff I would follow. The shirt was spotted here. On another note, have a look at this New Yorker piece that delved quite well into how Community has mined sci-fi fandom, Doctor Who and much else. The unexpected Peanuts/ Doctor Who combination. The online fan community for Harry Potter exceeds the population of Canada. Other fanbases? Not quite as impressive, but no small business at all. As spotted on I Can Has Cheezeburger, at least its sci-fi branch. A double-take did the trick for getting the subtle (well, for me, anyway) nod to Doctor Who in this TeeFury offer today, with a play on the old tuxedo-on-a-tee motif. My thanks to Allan for bringing this hilarious Threadless tee design (which recasts every incarnation of Doctor Who as an owl) to my attention. There haven't actually been that many, but here they are. OK, now I'm a kid again. TeeFury today mashes up a quartet of Doctor Who incarnations with my favourite band as an adolescent (well, most of the time). Tom Baker as Pete Townshend? Yes, please. The shirt is only available today. Admittedly geeky as I am, my knowledge of (and sometimes interest in) Doctor Who is a bit limited. 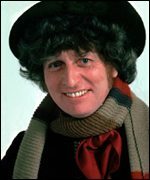 To this day, the image of Tom Baker comes to mind when I think of the character. With a new Who cast to take over the role next year - and one that makes even fans much older than I am feel old - here's a Wired photo gallery of the actors who have shared the time-jumping role. Tom Baker will always be the Doctor Who for many people, and has become famous again as the narrator of Little Britain. Now millions of little Britons will be hearing him tell them the content of their text messages. Brilliant. Tom Baker makes no attempt to suppress his pleasure at the latest twist in his long career. "What appeals to me most is the thought that I will be bringing good news to people whether it is a cheeky message, a birthday greeting or just a quick 'Hello.'" Voted the fourth most recognisable voice in the UK, after The Queen, Tony Blair and Lady Thatcher, Baker's dulcet tones now grace BT's Text, a service which allows mobile text messages to be sent and received on a home phone. His labours, an 11-day recording session which yielded 11,593 phrases, covering every sound in the English language, have already paid off. with the telecoms giant reporting a 69% surge in the service in the 24 hours following Baker's debut.